I believe that sourdough is a means to an end, not an end in itself. But sourdough can quickly be leveraged to produce a variety of satisfying and interesting results. Here, I have combined the last leeks from the fall garden, some wonderful Vermont ham, and half a wheel of Reblochon on a disk of sourdough puff pastry. Day 1: Mix 100 gm whole wheat flour, 100 gm regular flour, and 130 gm water in a covered bowl. Leave it on the counter. Days 2-7: Once a day, remove all but 100 gm of the initial mix and add another 100 gm flour, 60 gm water. The starter should now be convincingly bubbly and active. I have a container of starter on my counter at all times, so that I can quickly produce breads, dough, pastry, and other things like English muffins or peanut butter dog biscuits. One of the problems that people have with sourdough is long rising times, which makes cooking less spontaneous. Maintaining the starter on the counter, and feeding it twice a day, allows it to hold at a high level of activity. At home, we don't have to worry about any of that, except in principle. Keep the starter fed, use or refrigerate the extra. Use a covered straight-sided container, like this plastic sherbet box, and a straight-bladed plastic scraper. 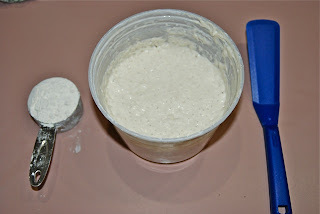 The straight sides make it easier to mix the starter and keep the sides clean. It's a 30-second job twice a day to mix in 1/2 cup of flour and a bit of water, to maintain the consistency. Notice that I don't specify the amount of water. Just add a bit, do it quickly, and move on. I like to keep the consistency about like wallpaper paste, or spackle. Thicker than that, and it's hard to mix quickly. Thinner than that, and it seems too active, and shows a tendency to use up the flour before the next feeding. Puff pastry consists of a detrempe, which is a mixture of flour, water, and salt, which is wrapped around butter. The envelope is then rolled, folded, and chilled several times. Each round of folding is called a "turn". The final pastry typically has around 75 layers of detrempe/butter, which expands radically when cut (freeing the edges) and baked in a hot oven. Traditional puff pastry uses lengthy periods of refrigeration to develop texture and flavor in the detrempe. But this puff pastry can be completed quickly, because the sourdough starter is already a mellowed, flavorful dough, and has a leavening component. Note: Keep the dough and the butter chilled throughout the process for best results. Sprinkle flour liberally on work surface, then place the starter on the bed of flour. 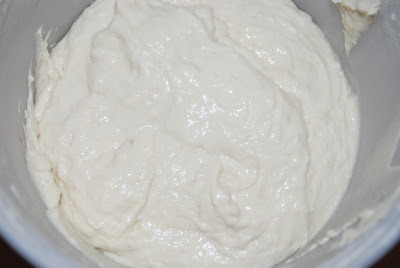 Gently fold starter over several times, to lightly incorporate flour, until you have a soft dough. The goal is to not totally deflate the starter, while developing it into a dough. Press the dough out into a 8" square. Chill while working on the butter. Work the butter under plastic with a rolling pin to make it somewhat malleable. Make sure the butter is the same general temperature as the dough before proceeding. If the butter is too hard, it will break up rather than roll out inside the dough envelope. Roll the butter out between two sheets of plastic wrap, to a 5" square. Place this on the dough, rotated a quarter turn, to resemble a diamond on the square of dough. Wrap the corners of dough around the butter like an envelope and seal together. Refrigerate 15 minutes. Place back on floured surface. Gently tap with rolling pin to distribute butter inside the package; then roll into an elongated rectangle, 6"x12". Fold this into 3, like folding a letter. This is the first turn. Refrigerate 15 minutes. Repeat steps 6 and 7 twice more, for a total of 3 turns. You can continue for two more turns, if desired, depending on the intended usage of the pastry. Butter a steel tart pan, and heat oven to 400 degrees. Roll out sourdough puff pastry to 1/4" thick, cut into a disk sized slightly larger than the pan bottom. Score the disk 1/2" from the edge, to allow the edge to rise independently from the center portion. Transfer pastry disk to the prepared pan. It should come slightly up the sides. Brush beaten egg on the outer (crust) edge. Refrigerate 15 minutes. 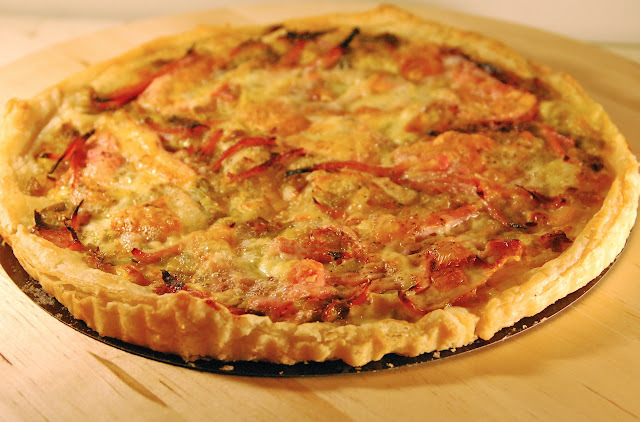 Assemble the tart: sprinkle the sauteed leeks on the prepared pastry, then the ham, and finally the Reblochon slices. Grind a bit of fresh pepper on top. 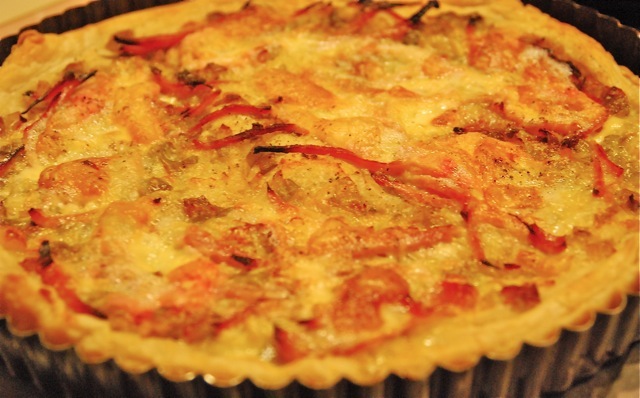 Bake at 400 until pastry is crisp and cheese is browned and bubbly, about 20 minutes. Remove from tart pan to wooden board; cut and serve immediately.